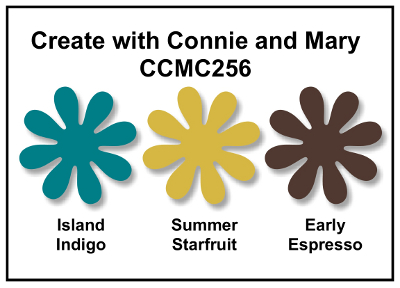 Thought I would switch gears today and join in on the color challenge over at www.createwithconnieandmary.com. These colors drew me in! What a great color combination that can be made feminine or masculine. Love it! I kept my card clean and simple. I decided to use some of my new toys out of the new catalog. Isn't the catalog fabulous?!? I have so much more on my wish list to get! *wink wink* All in time I tell myself. Today I thought I would highlight the Mosaic Madness bundle. By that I mean, the stamp set, coordinating punch and embossing folder! FABULOUS! Love it when we have such awesome coordinating products at our finger tips. Happy Stamping! Pretty card! I love the layout! And I love how you combined the texture and stamping for your backgrounds! Thanks for playing the challenge at Create with Connie and Mary!